In a packed stadium in Las Vegas, the Mexican gladiator Jesus Soto-Karass seemed to be the loneliest man in it. His lack of foot speed had been exposed as he attempted to chase down his opponent; he tried to corner him, but always ended up lagging behind. 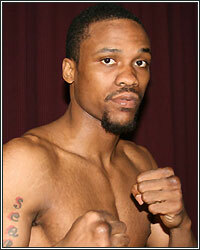 The fighter in the opposite corner, Mike Jones, was mostly out of his reach and boxed him all night in circles. When those rare opportunities came in the match where Soto-Karass found chances to give a beating, he realized he lacked the hand speed to consolidate his game strategy. His body shots were easily blocked by Jones' arms by simultaneously leaning to his left or right, and punches to the face were nicely slipped or blocked by Jones' broad shoulders. Occasionally, the lone Jesus would land a punch here or there, but they were shrugged off and exchanged with beautiful counter punches put together in a somewhat mechanical manner and animated by the monstrous grunts of his young brute opponent, who had now become ring savvy in their rematch. Jesus Soto-Karass kept reaching out for a fight, but he was too slow and too far to force it. Desperate, he'd drop his hands and taunt, calling out Jones to come forward, but all of that was a futile attempt to light up a fire. At times, when he came close to his opponent, the American, Mike Jones, who was simply too fast and smart and knew how to make his physical advantages work in his favor, would double up firing long, snappy jabs that kept him off again. But the game Jesus, as many had expected of him, kept coming all throughout the twelve round boxing match with blood in his face that kept dripping from slits around his eyes. It's a pity to see a brave warrior look bad knowing what they had to go through in training before they go up in the ring to fight and give their all. However, on the other side of the coin, my boxing coach, Mr. Lumacad, the head trainer of the Philippines' famed Elorde Gym, and I had a swell time watching the 5'11" welterweight boxer from Philadelphia glide swiftly with his ring generalship. It was fun watching a boxer with such height and tremendous physique showing suaveness in movement and skill, which he seemed to execute consistently all throughout the bout. He just kept on moving and playing it smart. Instead of falling for Soto-Karass' antics and taunting, he ducked and weaved, slipped through his punches and then moved again in circles. Jones has a natural reach advantage with a nice jab to go with it. "He's just as tall and probably as big as Margarito, except he's sweet to watch," I said. We all agreed that Mike Jones would be a regular world champion soon. Maybe he needs some polishing with his game, but his potential is evident. During the first fight against Jesus Soto-Karass, Mike Jones punched himself out and lost steam. He caused his own blunder, yet still won a controversial victory. It was a classic immature move for any professional boxer to commit, and it was close, but he won. As a consequence, he found himself on the receiving end of harsh criticism, seeing how his first victory over Soto-Karass only created more doubters than believers. But instead of drowning himself in chastise, he went out in this rematch like an experienced fighter should. He improvised. And going into the twelfth round of their second bout, everyone had already seen how deftly he had separated himself above his opponent's class. Instead of fighting fire with fire, he used the science of it by good movement, peppering Soto-karass with jabs as he circled around. He threw good combinations, used the rope and weaved like you haven't seen a big man do so cleverly for some time, frustrating his Mexican opponent. In the end, it's not the bravest nor the strongest who survives in this game, but he who learns to adapt to change.